JBC Beads offers the best selection of quality big hole beads at wholesale and bulk prices. Our large stock includes genuine, semi-precious gemstone big hole beads and freshwater big hole pearls. These stone large hole beads and large hole pearls are available in small, medium, and large sizes with consistent hole sizes ranging from 1.5mm to 3mm. 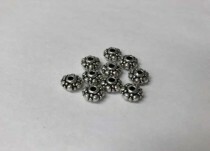 These larger holed beads are available in all of the popular shapes from the round big hole bead to the potato big hole pearl.